Empowerment for our children starts with fortifying our own balance and security. We listen to and share our own feelings. We strengthen our practices of connection and balance. We learn how to ground small moments of compassion, breath, and sensation into our own nervous systems. It is slow, and it takes intention, support, and tiny steps, often two steps forward, and one backwards. 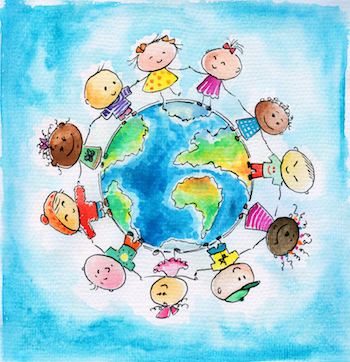 As anchors for our children, we are ready to pause, be curious, and hear their thoughts and feelings in order to help them make sense of the changing world around them (The World and Our Kids – Talking about what hurts and what helps). It’s never perfect. We get triggered and we miss opportunities. And, we learn and grow, repair, and head in the general direction. It’s through our learning…and commitment to the general direction and integrity…that we support our kids and their own empowerment. They see us risk, have breakthroughs, be vulnerable, make mistakes, learn from it, and step forward again. This gives them permission and courage to express themselves. With our support, they begin to learn with life, and, in time, find meaning. There’s another piece to this foundational empowerment nest – the message that a child matters. Behavior is separate from the mattering, and what is inside is worthy of celebration. This contradicts teaching from our culture. While society tells us that success, appearance, and doing is what is of value, our job is to discover what we use to define our identities. We are then more conscious of what types of expectations we put on our children. In a dream, I saw a baby being presented to the village. Everyone was celebrating the baby for herself. Imagine the power. All welcomed the child into the circle. Passed around, each one looked into her eyes, telling her how much she mattered just for being alive. There was the moment of connection when each saw the beauty and strength inside the little child. We remember that we are born whole. We find strength in the reminder. The same adults later would direct the child to safety, have clear expectations, and support the child through, not protect the child from, making mistakes and experiencing natural consequences. They would continue to remember their positive expectations for the child. They would see a authentic future self, bringing gifts to the world. How does mattering, meaning, and learning translate into actual strategies of empowerment in this pretty crazy changing world? Listen to feelings, and help children sort through things without jumping in to fix it. When they express concern about something, listen to thoughts and feelings first, then investigate with them ways they can be active. Listen to and consider their ideas. Acknowledge broadened perspectives and positive visions. Let them experience failure and mistakes. Evaluate the messages that they are getting about “failure”, and reframe the negative ones. See the victory and meaning in “failure”. Be honest and vulnerable about your own embedded ideas about mistakes and failures. Model and expect accountability from a non-shaming-blaming perspective. Be there to help them sort their way through. Then encourage next steps, vision and ideas. Collect stories of positive visions and change created by people of all ages and diversity. Reflect back the ripples that happen when they or others affect change. Involve them in creation of activities that affect change. Within the classroom or family, mutually create and tell stories of inspiration and positive change. Model skills of collaboration, and listening empathetically. Acknowledge acts of courage and social risks in communication. Model plugging into resources and communities of support. Reflect the “we” – that change comes about by the actions and ideas of many coming together. Because we are learning this ourselves, it’s a tall order, and not for the faint of heart. We will be right in there with our children. We are asking ourselves, “Is change possible?” “How do we affect change? We don’t have to know the answers. It’s about staying curious and open to the next pebble along the path representing a positive future. There will be times of disappointment and loss. Sometimes our own lives will defy expectations and feel turned upside down. We will have to reach deeper and further to find connections and resilience. It can be rough. The same is true for our children.